While I had already activated Mt Elliot, activating it again would not gain me any activator points this year but while I had decided to get away from the urban electrical noise, chasing from a SOTA summit rather than you a good portable location, has the advantage of giving other chasers points in the award scheme and I would gain chaser points from any Summit-to-Summit contacts. As I had given a lecture on SOTA to the Central Coast ARC on Saturday, I wanted to be on-air to give any of the lecture attendees who decided to try SOTA chasing, a point and indeed one, Karen VK2AKB was on chasing on Sunday. The weather forecast was for light showers and for once it was correct, just a few sprinklings of rain en-route to site and a couple of times after I was set up. But today was to be a very special day as I had quietly crept up on the 1000 chaser points (Shack Sloth) level and being at 993 points by the Friday, I was confident of tipping it over the 1000 through contacts on Saturday. When I saw Glen VK1FB was heading out to Mount Ginini, this was ideal – an 8 pointer that would take me to 1001 points, so I dropped Glen an email and we set up a sked for 9am local when he planned to be on the summit. With my activation of Mt Elliot on the first day of SOTA in VK2 I had activated in 5 associations (G, DL, OE, VK1 and now VK2), this meant I could apply for the Bronze Mountain Explorer award, which I did a week ago. 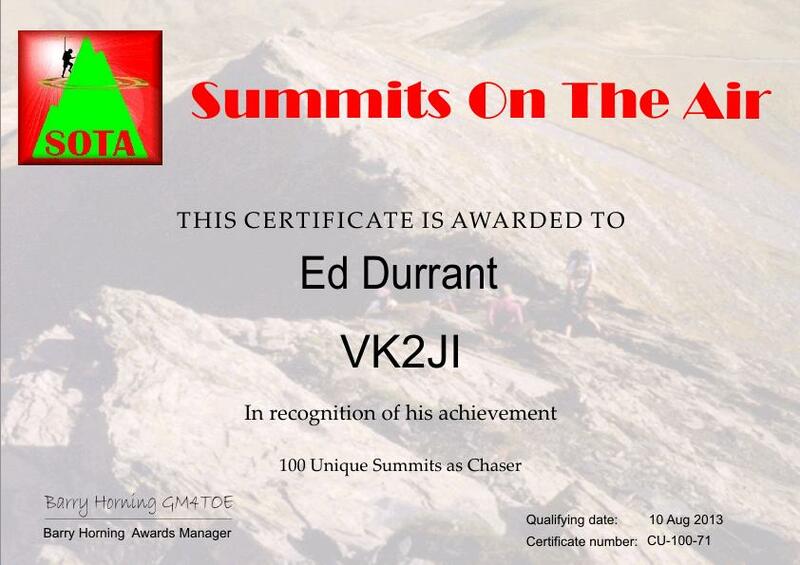 During last week I was looking through at the various awards, I realised I was also eligible for the 100 point unique summits chased (more wall paper for the shack, so I applied for that as well). 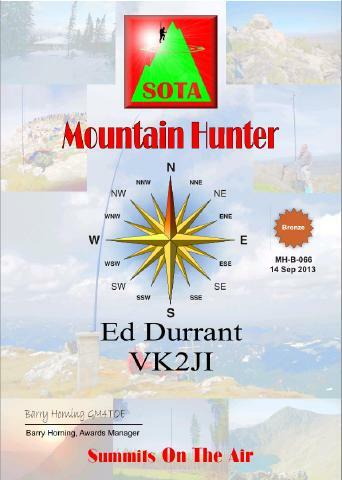 To my surprise I also realised I was only one contact away from Mountain Hunter Bronze! Would you believe it on Friday evening I see that Brendan VK4FADI and Glen VK4FSCC will be out at 7:30am(!!) activating Mt Mary Smokes and that would be the one I need to have chased 2 summits in each of 5 associations (VKs1,2,3,4 &5). The only small problem is 7:30 am, when they plan to be on, is about when I would be leaving to go to Mt. Elliot in time for my sked at 9am with Glen. So the night before I packed everything in the car ready to go. At 7:30am I am alert and listening for the VK4 boys. Then exactly on schedule, Brendan VK4FADI/P starts calling CQ at a good 5-3 into my home station. I call and work Brendan and Glen (VK4FSCC/P), that’s the Mountain Hunter in the bag and I quickly close down the home station and dash to the car to get up to Mt. Elliot. As it turns out I had a good run taking about 10 minutes less than normal to get to site, I grab my packs and head down the trail to descend 25m out of and back into the activation area and (out of breath) return to my usual activation spot, where a clear track has been beaten through the brush from previous tests and the last activation. The antenna goes up first, followed by the chairs and lastly the rig itself. I have about 10 minutes to spare and tune around 40 to check I can hear OK. This time I hear Glen VK4FSCC calling CQ (now up at 5-5 from the better location) and so decide to give him and Brendan a call. I will not gain any points from these calls as I had already worked them, but this would give them points for a Summit to Summit contact. Most importantly this wont kick the total over the 1000 point mark. I wanted that to be my contact with Glen VK1FB as agreed and indeed about 15 minutes later after chatting to Andrew VK2UH on Glen and my agreed sked frequency, there was Glen with a solid 5-9 signal on his new antenna. That was it – 1005 chaser points achieved! So now I could relax and enjoy the activation both before and after UTC change-over. Apparently my second contact with Marshall VK3MRG/P (who was portable from the banks of the Yarra) tipped him over the 1000 chaser points as well, that was a nice surprise – this has really turned out to be a special day. I tried 20m and 30m as well. I was disappointed with 20m with no contacts despite spotting and calling, calling, calling but when I moved to 30m I bagged 5 contacts a couple who reported they could not quite hear me on 40m but 30m was fine. This is a relief as my previous attempt to get onto 30m from Canoelands Ridge the previous Sunday failed with errors being displayed on the FT817. After a reset to factory defaults, all seems fine now. The SOTABeams Band-Hopper linked dipole seems to be working fine. I wonder if I should modify it to add 12m to its current 20,30,40 & 80m capabilities? As usual an important part of any activation is making a few pictures or videos, this time I have more radio “footage” of contacts I made and listened to – perhaps you are one of the stations I “caught” on video? 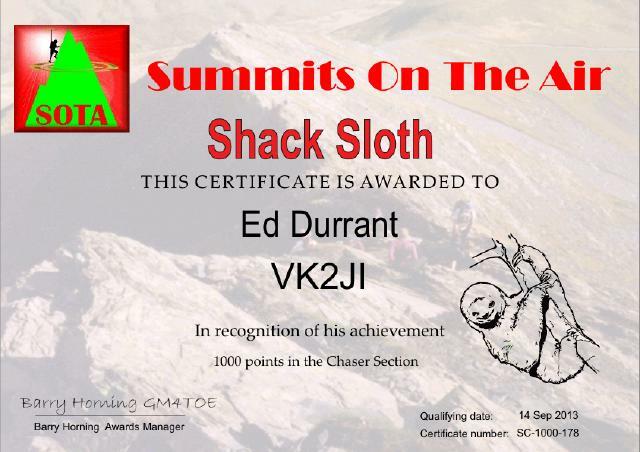 I’d like to put out a big thanks to all of the activators and chasers who have made my participation in the SOTA scheme such an enjoyable and pleasant one. I’d like to thank particularly Glen VK1FB/P for tipping my score over the 1000 mark and Brendan VK4FADI and Glen VK4FSCC for getting me my Bronze Mountain Hunter award but of course I would never have got near these scores without the whole community of activators and helpful chasers guiding me to these levels. It’s taken me just over 6 months to get to Shack Sloth. Now that I’ve started activating, I suspect i will most likely need nearer to 6 years to get to Mountain Goat (if I ever do). I know this is a part of the hobby that I am really enjoying and it’s mainly because of the kindness and politeness of all of the rest of you helping each other along. Something that I try to emulate.